Amram Musungu (born August 28, 1978) is a member of the Mormon Tabernacle Choir and a prominent Kenyan organizer of charitable efforts in Utah. He is currently one of two black men in the Mormon Tabernacle Choir. He has also been infuencial in bringing many people from Africa who live in Salt Lake City into The Church of Jesus Christ of Latter-day Saints (LDS Church). Musungu was raised in Hamuyndi, Kenya, in the western part of the country. He moved to Nairobi at age 14 and shortly afterward met missionaries from the LDS Church. He was baptized into the LDS Church on June 7, 1992. From about 1997 to 1999 Musungu served as a missionary in the Church's Kenya Nairobi Mission, serving much of that time in Tanzania. After his mission, Musungu came to Utah, where he studied at LDS Business College, where he received a business degree, and Westminster College where he received a BS in accounting. He is currently pursuing a Ph.D. at the University of Utah. Musungu founded the Musungu HIV-AIDS Support Organization which seeks to help the widows and orphans made so by the ravishes of AIDS in Kenya. He has been the coordinator of Swahili language translation for LDS Church general conferences since 1998. He has been a member of the Mormon Tabernacle Choir since 2003. Since coming to Salt Lake City, Musungu has been involved in teaching about 100 Africans about the LDS Church. Between September 2006 and September 2007, 30 of the people Musungu introduced to Mormonism were baptized. Michael Rice, the Genesis Group mission leader, states that Musungu helped bring 35 people into the church in the last six months of 2007. Most notable among the people Musungu baptized was Noelle Nkoy, a Utah-born child of a father who was raised in the Democratic Republic of the Congo. About two years after her baptism, Noelle married Musungu in the Salt Lake Temple on April 15, 2006. Since their marriage, the Musungus have worked together in sharing Mormonism with many people. Musungu also teaches Swahili at Brigham Young University and serves as an advisor to the philanthropic group All One People. 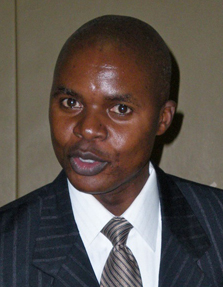 In 2006, Musungu received LDS Business College's alumni achievement award. This page was last edited on 30 August 2010, at 17:14.